If you got sick and tired of using the public transport and you decided to use your car to go to work, visit friends in the countryside or just do the shopping for the week, then, you must have noticed that the more you use your car, the more wear and tear is caused to the upholstery. Over the time, it gets dirty and even if you take good care of it, you might not make it ideally clean without the help of our professionals. 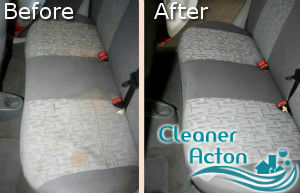 We are a cleaning company providing professional car upholstery cleaning services in Acton at competitive prices. We provide the best solution to dirt and odours removal, so call us now and get more information about our service. 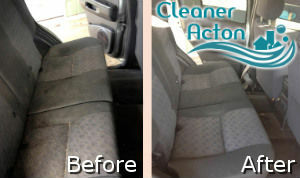 Car upholstery cleaning can be an expensive service and many people refrain from booking because of that reason. However, you will not have such a problem with us because we have the best prices in Acton, W3. We bet the quote our operators will give you will be unbeatable! You don’t have to waste your free time for car upholstery cleaning. Our cleaners will be on your driveway on time and they will use state of the art steam cleaning machines. They are powerful and after the service the upholstery will be dirt-free and fresh smelling. The steam cleaning machines are more effective than the regular vacuum cleaning and dusting procedures because they extract the dirt built up in the fabrics. Upholstery usually absorbs bad smells such as tobacco and foods. If you take your dog with you and you notice stains or hair stuck in the upholstery, you should call us asap and restore its good condition. We work in Acton every day and we have a team of dedicated and skilled cleaners. Don’t miss our offer. Book car upholstery cleaning service now and enjoy the freshness our cleaners ensure. You can reach us via phone at any time. We operate during the weekends and bank holidays, too.